This is the third (one, two) in a series. The statistics come from NationMaster. The work is released under a creative commons attribution license. The large rectangle surrounding the image of Thailand represents 10.000 Thai people. 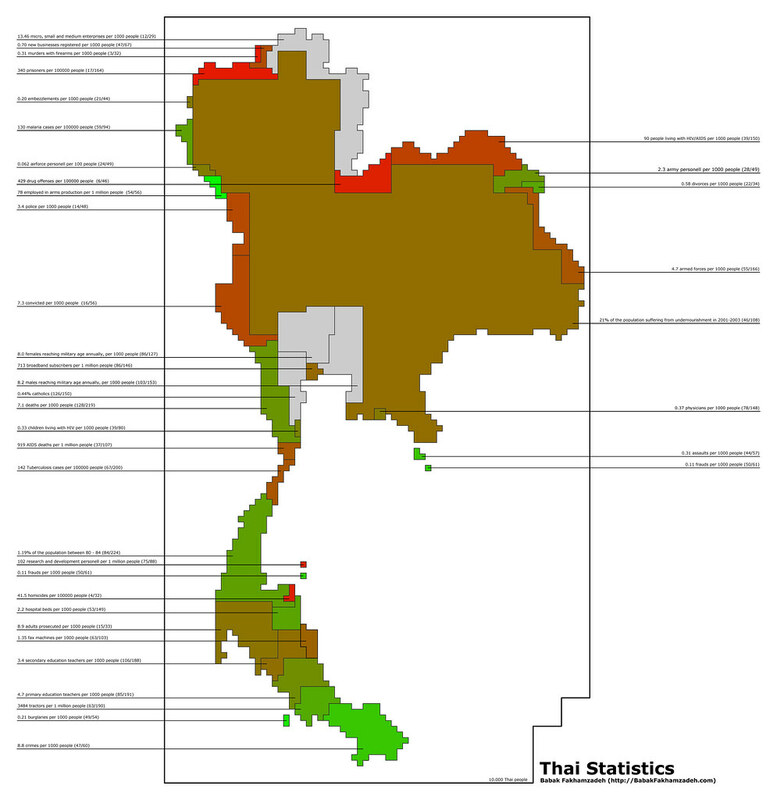 The statistics which, visualised, together make up the image of Thailand represent information directly related to the size of the population. This means that the size of the individual areas is relative to the number of individuals affected by that particular statistic. Although the image, created by the individual statistics, resembles Thailand, the statistical information itself is devoid of geographical information, besides representing Thailand as a whole. The appearance of geographical information is only an illusion. + The high level of undernourishment in the early years of this decade (21%). + The high number of murders with firearms (0.31 murders with firearms per 1000 people). Also, a lot of the numbers available on NationMaster for Thailand were obviously wrong, mostly related to media, or incomplete, related to health.